Buffalo Check Home Decor Under $100 for Your Entire House! If you haven’t already noticed, the buffalo check pattern is IN! Now, I’m not normally one to hop on what’s in style just because. But y’all…I am totally obsessed on board with this one. It’s so simple yet adds so much character to a space, and fits perfectly if you’re a lover of farmhouse decor! 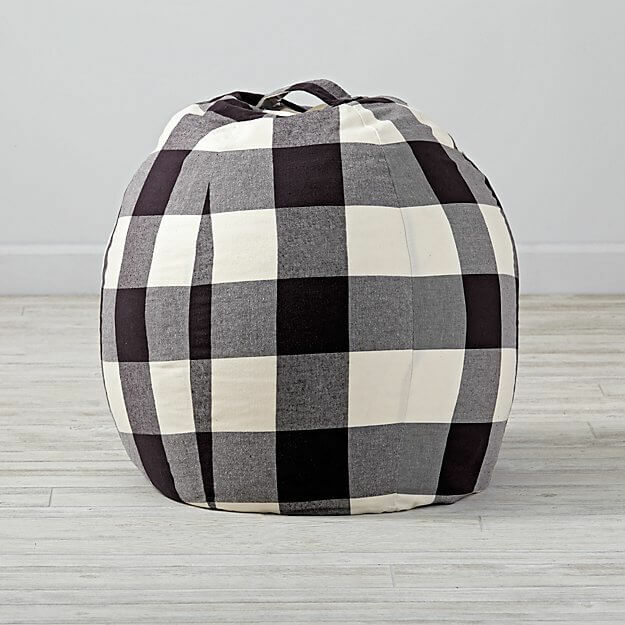 Given that everyone is quickly getting on the buffalo check bandwagon, I thought I would scour the internet for great buffalo check home decor that you can get on a budget and share it with you. I ended up with some amazing finds…enough that I was even able to categorize it all by room. 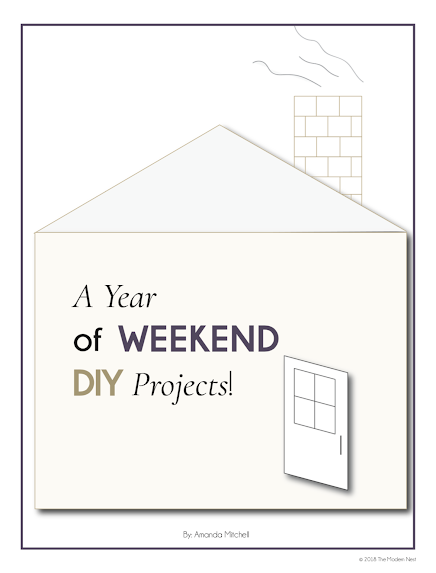 So let’s see what buffalo check home decor goodies might work great in your space, shall we? Joanna Gaines has done it again! Her Magnolia Home wallpaper is absolutely stunning! Pop this on an accent wall and you’ll be wowing everyone that comes into your house! OK, if you’ve ever bought a duvet cover, you probably already know that they are super expensive! 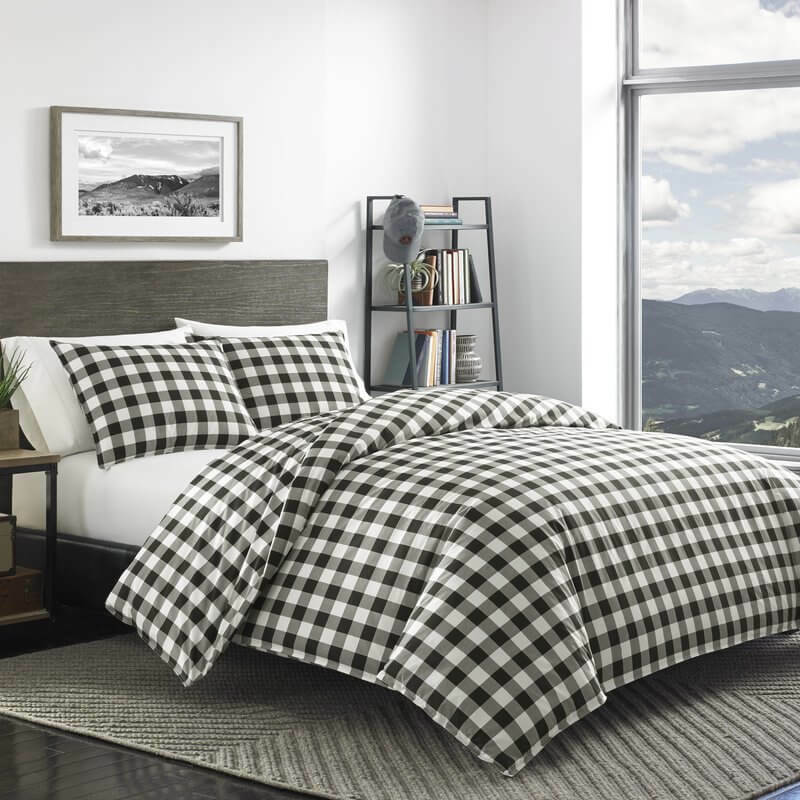 So finding a cute buffalo check duvet cover set under $100 was literally a dream! What makes a cozy throw even better? Personalizing it! 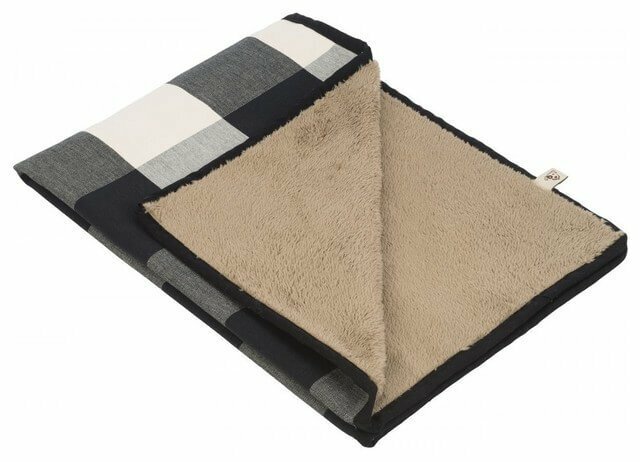 If you live where winters are harsh then a wool throw like this or this may be just the key to feeling warm and cozy! 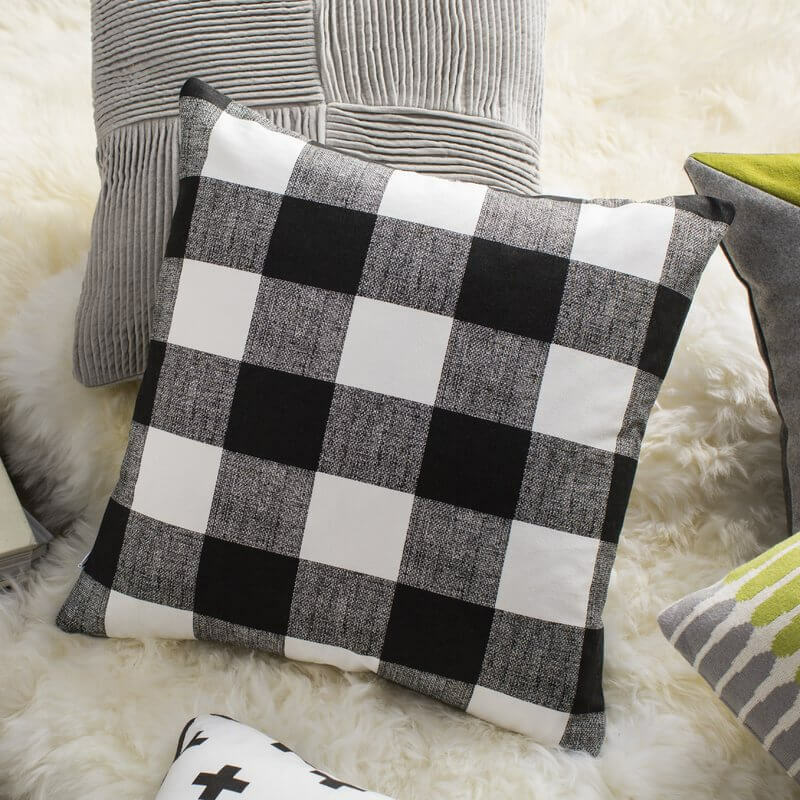 Pillows add those warm finishing touches to home decor, and buffalo check throw pillows are no different! If you already feel like you have too many pillows, you could also get just a pillow cover for a simple update! Hey, even Fido should be able to sleep in style! 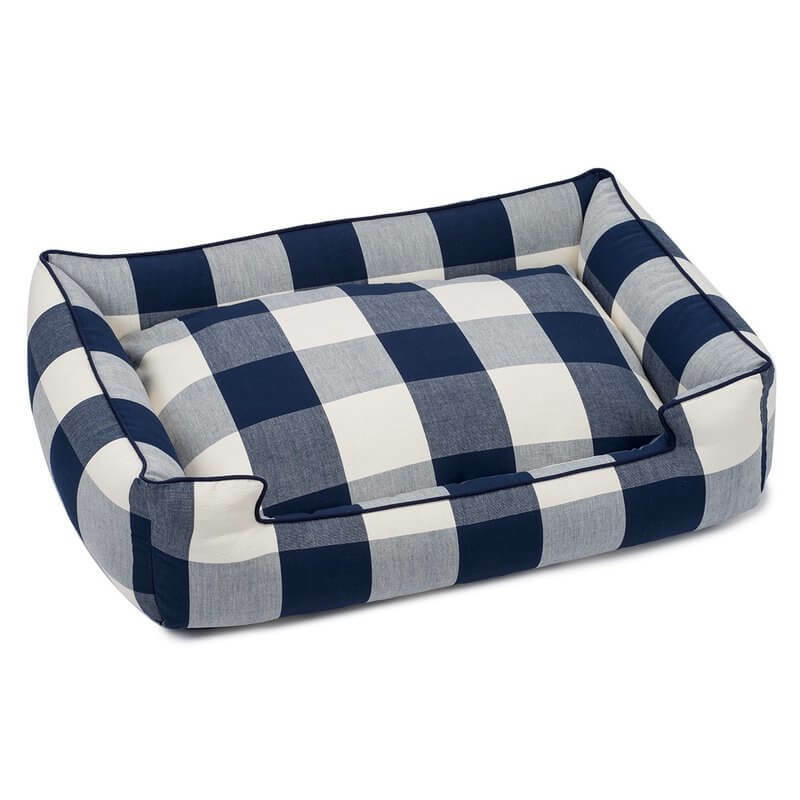 In addition to this pet bed being absolutely ADORABLE, the cover comes off so you can wash it! I’ve had a few pet beds smell nasty in my time, so this is a huge win! Add some fun to your dinner table and reduce your environmental impact at the same time by using these adorable buffalo check cloth napkins! Jazz up your table with this awesome table runner. And if you want to go more rustic you can check out this burlap table runner too! However, if the gold rim isn’t your thing you can also grab this simpler coffee mug! If doing dishes is one of your less-than-enjoyable to-do’s, then maybe these dish towels will help you feel better! You can also get the whole kitchen set with an apron, pot holders, and oven mitts! I love this nursery set by Caden Lane! 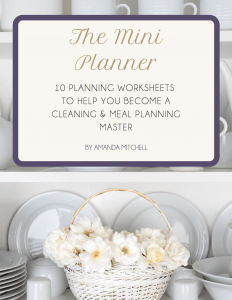 Most of the individual pieces are under $100, but if you’re looking for a full set that’s high style and in your budget, this is a great way to go! I personally purchased their curtains for my toddler’s room. 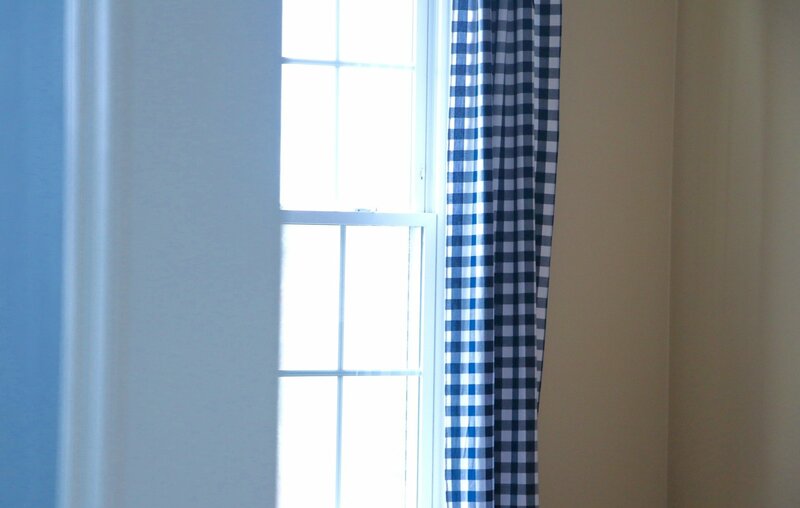 Even though they took a while to come in (they are made to order), they are my favorite curtains of all time! They are super soft and have great drape without being too heavy! If you ever read my post on sustainable yarn, you probably already know that cotton is one of the most heavily pesticide-treated plants in the world. But finding good quality and adorable organic cotton products can be challenging. So if you’re on the lookout for organic bedding for your little, this fits the bill! Give your bathroom great personality with this awesome shower curtain! I’m normally a fan of all-white towels for my bathroom, but these just look amazing! They look so warm and cozy, and would be a great way to finish a warm bath on a cold winter’s night! This sling bag looks super sturdy, fashionable, and useful with all its pockets! This one is definitely going on my Christmas list! Want to go out in style? Grab this travel tote and be on your way! So there you have my ultimate list of buffalo check home decor under $100! For more DIY and home decor advice, check out how I furnished my living room with Pottery Barn for under $1000 and inexpensive tricks to make your old home look new again! « DIY Kids Room Makeover Reveal! 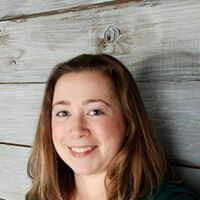 Hi Amanda, I just want to decorate my farm house in a new and different way. 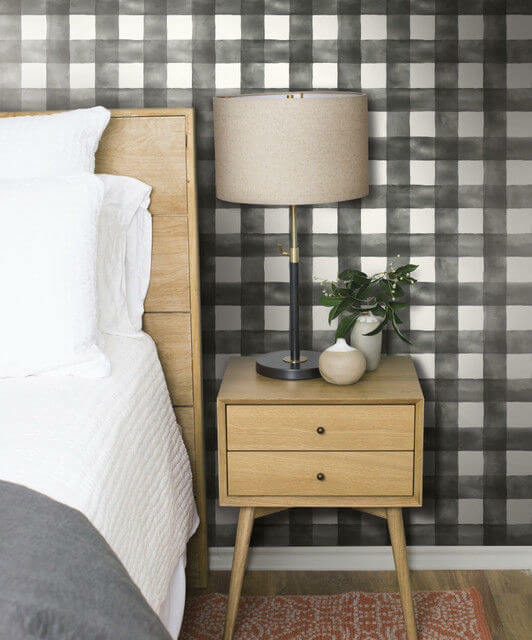 I got the idea of buffalo check pattern for decorating it from your blog. Really, it is the best way to give a new look to home and farm house. So thanks and keep sharing. I’m glad it was helpful! 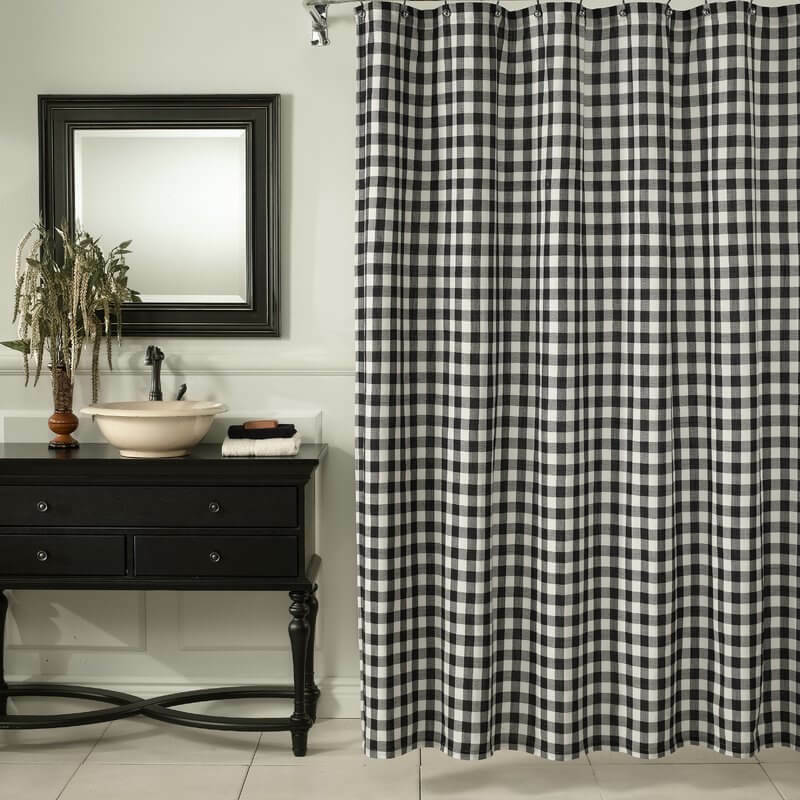 Buffalo check definitely is a great addition to the farmhouse style! Thanks for sharing, I have been looking for some new ideas for my . I love the check design on the pillows. Sigh, I can feel my wallet coming out again!! Thank you for the inspiration. Thanks for sharing!